message: Information on this website should be verified by other sources before using, and viewed only when it is safe to do so. Click Show Map above to see a live Google map with custom overlay showing Long Branch Beach parking, accesses, facilities, and amenities. Click Show Me to center map at your current location. Also click Show Me or reload the page to reset the map if needed. Click the Find Me button to show your current location on map with a red marker. Click the Audio button to hear a message for your current location on map. Click GPS to choose your favorite GPS app. Optionally select (thereby opening a pop-up window) any parking P or other icon or beach name on the map as your precise destination. Click GO to launch your GPS app and automatically get directions from your current location to the selected destination. If you encounter detours due to construction such as in the Pier Village area, simply follow any detour signs, then your GPS can be expected to update your route. Note also that you can zoom out on the Google map to see regional and highway icons, and click on these for more information. Zooming in reveals more detail, such as photos. Click here for 511NJ free phone and web service for traffic information that consolidates traffic and transportation information into a one-stop resource for commuters and motorists in the Garden State, with up-to-the-minute traffic conditions, available seven days a week, 365 days a year. For another site for traffic information, click here for navbug.com. The orange-colored block-shaped highlighting on the Long Branch beach map shows parking available for the beach. Parking is on-street, at ground-level lots, or in garages, all equipped with state-of-the-art pay stations. On-street parking spaces are mostly pay in summer and free during the off-season. Also available is residential area parking at no cost on streets just west of Ocean Blvd along the entire length of beach. When parking, observe signs and do not park too close to corners to avoid a summons for a parking violation. New Jersey State Statutes prohibit motor vehicle parking within 25 feet of a crosswalk or side line of a street or intersecting highway, within 50 feet of a stop sign, or blocking a driveway (NJ Code Title 39:4-138). When you click an icon or beach name on the map, you have selected it, and a small window opens offering information or web links for that location. A button labeled Show Photos also appears at top left of the screen, which if clicked will call up a portfolio of photos for the selected location. Click Hide Photos to return to the map. If you will be launching your GPS app using the GPS buttons above, you can optionally first click on any icon or name label on the map. When the small window opens, that choice of icon or label is confirmed as your precise GPS destination. There are five restroom buildings on the boardwalk, at the Great Lawn, Laird St., North Bath Ave, Cottage Place, and West End. The only public restroom within Pier Village, not including retail establishments, is in the Pier Village Garage accessible from Chelsea Ave. or Melrose Terrace. Near Pier Village at Morris Ave. adjacent to the boardwalk there are restroom trailers. At Seaview Ave and at West End Park there are portable toilets. Showers are located outdoors near most beach entrances on platforms at beach level as you enter or leave the beach. On the map these are indicated by an icon of a showering character. Sixteen sand volleyball courts are found from just south of the North Bath Ave. entrance up to the Pavilion Ave entrance. There are two sand volleyball courts just south of Laird Ave. entrance, and one sand volleyball court at Pier Village beach. Six large pirate ship play centers are spaced out along the entire beachfront. Long Branch City has numerous restaurants offering diverse dining choices. There are many restaurants on or near the boardwalk including at Brighton Ave, Pier Village, Cooper Ave, and Avenel Blvd. Right on the boardwalk there are two full-menu snackbars at boardwalk and West End and also at boardwalk and North Bath Ave. A reduced-menu snackbar is at boardwalk and Cottage Place. The Monmouth County Skateboard Park is located just north of Seven Presidents Oceanfront Park. Monmouth County Seven Presidents Oceanfront Park is managed separately from Long Branch Beach, and has separate parking and admission. For more information about this county-managed beach click on the map label and the web link. The Long Branch Beach map display can be customized by clicking buttons below to "Show" or "Hide" different features. 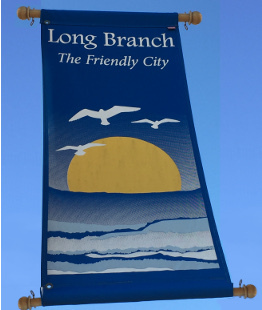 The Atlantic Ocean and neighboring Long Branch City share an important characteristic. Both enjoy richly diverse ecosystems. The "schools" (whether they be fish or students) represent great and balanced ethnic variety. Oean and city each have a range of habitats reflecting wide socio-economic diversity. In ocean and city the complex mix of cultures contributes to flourishing, sustainable and highly effective communities. 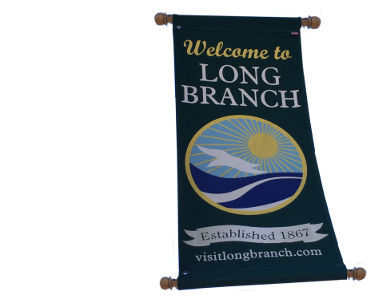 See Long Branch demographics from Neighborhood Scout, including sources and methodology.